[UPDATE]: The subject of animal rights is complex, and I won’t get into the intricacies of it here — except to point out that those who are calling Christopher Filardi a “murderer” (for euthanizing a bird) believe perforce — by extension — that the domestication of animals is slavery, and that zoos are a form of imprisonment or interment camp, and that pet-ownership, as well, is a form of slavery. Also, when PETA in particular refers to Christopher Filardi as a murderer, what then are they engaged in when by their own admission they euthanize thousands upon thousands of healthy animals a year? Answer: by their own brand of reasoning, they’re engaged in mass murder. 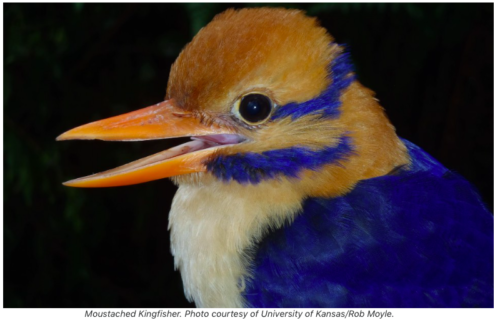 The ornithologist Christopher Filardi has recently been hounded into hiding for publicly practicing his science — which is to say, he carried on what has been the standard practice in the natural sciences for centuries now: he euthanized a kingfisher to collect it as a sample for his museum. The overwhelming majority of his detractors belong to the Party of Science — id est: members of groups like Earth Liberation Front, which among many, many other things committed a clear-cut act of terror (for which they were convicted) by firebombing the Center for Urban Horticulture at the University of Washington, where Dr. Filardi was once a graduate student. Yes, indeed, it is more than a little frightening to be harassed in this way — i.e. online through social media — not primarily because you fear for your safety, but because what you suddenly sense before you is an extreme and hostile Borg-like presence that has forever lost some vital part of its rationality. [Filardi] wrote an essay for Audubon explaining the many steps he’d taken to ensure that the taking of a single kingfisher would not cause harm, including a survey of the population, which he estimated at 4,000—a ‘robust number for a large island bird.’ He highlighted the role the bird played in conservation efforts: After his findings were presented to tribal, local, and national officials, they resolved to protect the area from being mined or logged. His essay received over 900 comments, the most up-voted of which called him a murderer. [I]t has led him—and many other ornithologists with whom I spoke, almost all of whom asked me not to use their names—to be extremely cautious about attracting any kind of attention. Many research expeditions are no longer being publicized; in some cases, there is a total blackout on media. Reasoning with a mob, online or off, is of course futile; and there comes a point — such as when members of the maddened mob sign you up via your email address for ghastly websites — that you know beyond the shadow of any doubt that these people will stop at very little, if anything. This kind of reaction should remind us of previous superstitious taboos against practices like dissecting cadavers, activities that were scientifically valuable but emotionally repugnant to an ignorant mob and obscurantist authorities. In this case, the main push came from precisely the kind of left-leaning activists—particularly PETA and the animal rights crowd—who so often like to pose as advocates of science. The comparison to a pre-scientific era only seems more appropriate the deeper you probe this case. We already see historical scholarship having to be conducted in secret, just as in the days of the monasteries, in order to avoid attack by a hostile outside world. Now the same thing is happening to science. There is a lesson here about the psychology of online mobs, and a warning that in an era when science lives by social media it can die by social media.